We all have a LOT to keep track of day-to-day. Reminders, tasks, appointments, events, errand lists… Our students have their own share of things to keep track of, from school to extra-curricular activities, chores, and social events. Have you heard the term Bullet Journal mentioned by young adults and wondered, what is this latest craze all about? It’s a rising trend among middle and high school age kids, but many adults enjoy it as well. On Instagram alone, you’ll find that over 2.5 million posts with the hashtag #bulletjournal! For the past year bullet journaling was all my 8th grader talked about, thanks to her ingenious Integrated Language Arts teacher Mrs. Caskey at Maus Middle School. At first, I thought the concept sounded ridiculous and I was concerned about how much time my daughter devoted to the process. What I didn’t realize, however, was that journaling is a great method for staying organized. Plus, it allows the user to purge their emotions, thoughts, and feelings on paper…which is great for the psyche. It’s a cathartic and emotional release! So what, exactly, is bullet journaling? It’s a fun and unique concept of planning and journaling in a dotted notebook, developed by Ryder Carroll. Diagnosed with learning disabilities early in life, he set out to find alternate ways to be focused and productive. Following years of trial and error, he developed a methodology that went far beyond the basics of organization. 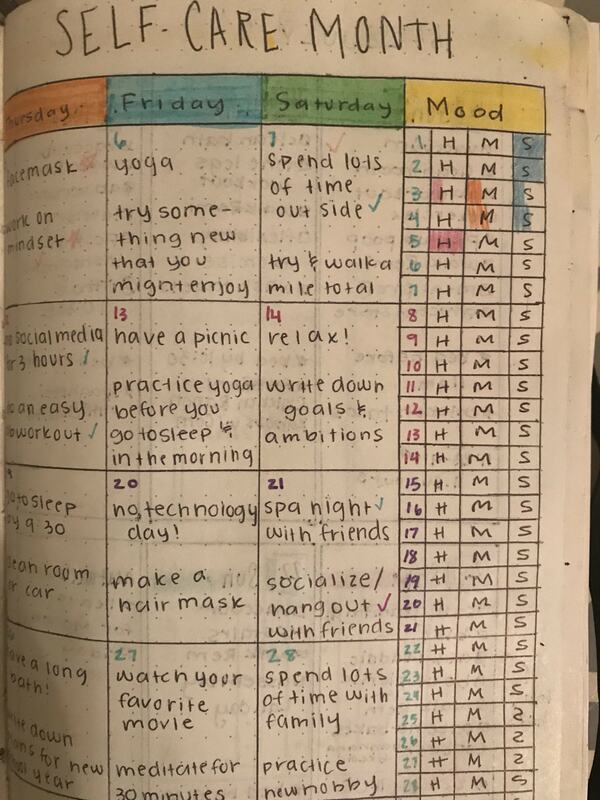 The bullet journal method allows you to plan daily, weekly, monthly and yearly, creating to-do lists, events, hopes and dreams, and future logs. It can even act as a diary to jot down experiences and feelings. Furthermore, a bullet journal encourages creative and artistic talents. You can simply doodle, or be as creative as like! In essence, no two journals will look the same. You may want to utilize the more detailed bullet journal methodology. The process utilizes an index, symbols, rapid logging, topics, and page numbers. For avid planners and organizers, the detailed method might be appealing. “Bullets” are essentially short-form sentences paired with symbols that visually categorize your entries into: Tasks, Events, or Notes. The process is a bit too detailed for me to store all of my information. I keep it simple with a weekly log, monthly theme page, and pages for ideas, thoughts, and notes. But the detailed philosophy is quite interesting if you dig deeper. Watch this quick tutorial to learn more. If the bullets or dots aren’t your things, then consider a ‘DIY’ with a regular lined journal. I purchased a journal with inspirational quotes on the left page and lines on the right. It allows me to read a positive quote and design my entries via lines, as opposed to dots. Get creative and break out your hidden artistic talent! Beyond shorthand, themes and color schemes can be utilized to store information! For example, my daughter drew pictures of the beach for our vacation to Cancún. In my journal, I drew a tree for the month of September and utilized fall colors of orange, yellow, red, brown and green. I named the month ‘Fall into September’ since September can be a little chaotic with back to school adjustments for kids and parents (i.e. school drop off/pick up times, sports, sleeping and bed-time changes). I made September’s focus a personal growth month so that I don’t slip up on my own goals. Remember, it’s very customizable – it’s your way to store information and you can track anything you like! For instance, some people are tracking their water intake, meal prep, monthly budgets and expenditures, habits, bucket lists, and even gratitude! For small children, it teaches an enjoyable way to be organized and reinforces topics like spelling the days and months of the year. Kids can utilize stickers, washi tape and various colors of gel pens to customize their bullet journals. The journals also help unorganized teenagers or adults become organized in a unique way that works for them. In my case, it helps me to not double book appointments! Dotted grid journals can be found inexpensively at Walmart in numerous colors and patterns for as little as $5.98. Or, you might want to splurge on a moleskin that can be found at Barnes & Noble or online at Amazon. I recommend a size that you can fit in a backpack or purse. Not too big or small, but something you will actually carry around with you. If you can’t easily carry it, it defeats the purpose of having a Bullet Journal! If you’re in need of a unique and inexpensive gift idea, bullet journals are a great way to go. Consider purchasing one in the person’s favorite color or in a design that’s unique to their style. In our hectic and fast-paced society, we can all benefit from a structured and systematic way to store information. Opt for a bullet journal this season to stay organized, express yourself, process your emotions, or to stay on the fast track with your goals! Useful Tip: What you need to get started: Gridded notebook or journal, pen or gel pens, washi tape, stickers, and page clips.